Before his unexpected exit, one that lasted almost two long years, unbeaten welterweight champ Keith Thurman was either well on his way to hands down proving he was the best 147 pound fighter on the planet, or he had in fact already done so. Having claimed both the WBC and the WBA belts, with big wins over the likes of Shawn Porter and Danny Garcia to his name, “One Time” was very arguably the man at ’47. 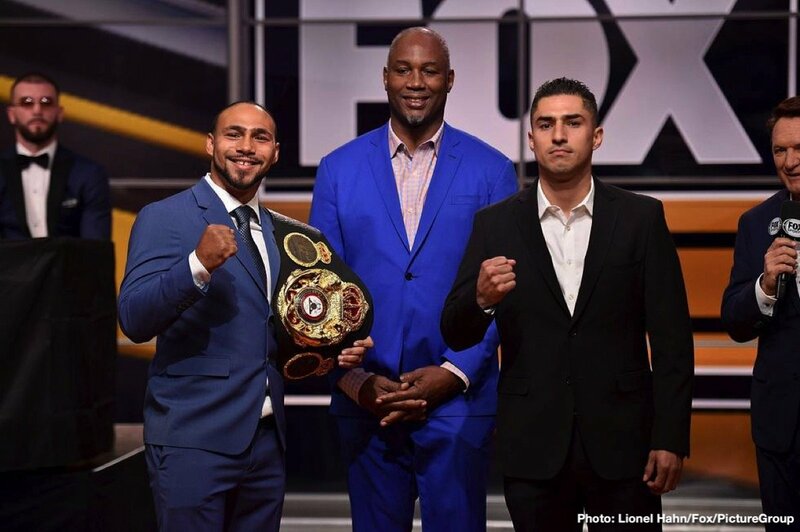 However, since Thurman’s injury enforced departure – one that is set to officially end in January of next year, against tough warrior Josesito Lopez – not one but two superb fighters have become world champions at welterweight: Errol Spence, the IBF boss, and Terence Crawford, the WBO ruler. Thurman now has to face, and defeat, both men if he’s to prove (or re-prove) he is the top dog at welterweight. But will we see both fights? Will we even see Thurman, 28-0(22) face one of these two unbeaten pound-for-pounders? Thurman has been off a long time so he is more than deserving of a pass for his first fight back (not that Lopez is looking at being passed over without a fight, and Josesito has, as we know, upset the odds before now) – but after that fans will be calling for “One Time” to get it on with either Spence or Crawford. For as long as both men are unbeaten and occupy the division, Thurman will hear the names Spence and Crawford in his ear. READ Crawford vs. Khan: Do P4P low blows hurt? It is possible that Spence and Crawford will fight each other in what would be a huge and important fight. But Spence Vs. Crawford aside, there is nothing bigger or more interesting than Spence Vs. Thurman and Crawford Vs. Thurman. Thurman says he is back to reclaim his WBC belt, so this would indicate the man from Florida will face current WBC champ Shawn Porter in a rematch down the road. This too would be most welcome by fight fans, seeing how the first fight, won by close decision by Thurman, was such a thriller. But after that, if he can indeed repeat his win over Porter, Thurman has two fights, both of equal importance, that he simply has to attend to. Can Thurman, at age 30 later this month, pick up where he left off, by taking on and beating the baddest and the best in his weight division? Spence and Crawford want to know.